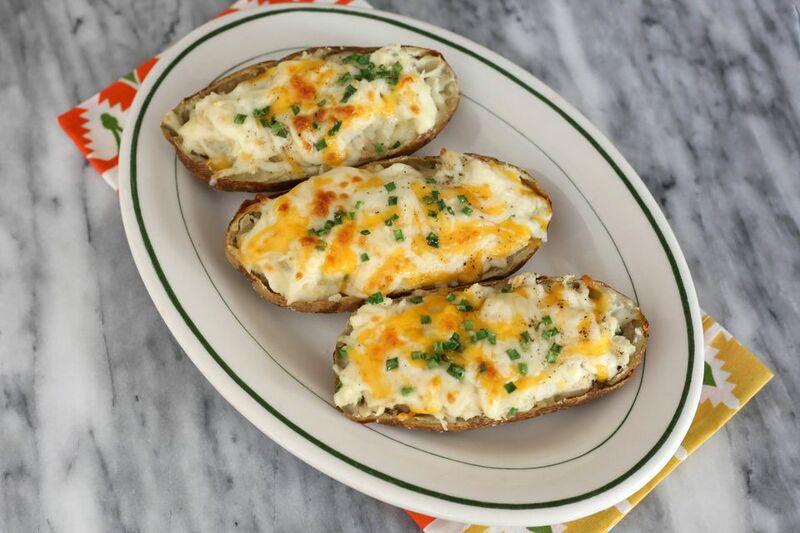 These crab stuffed potatoes make a fantastic snack for a game day crowd. The combination of lump crabmeat, garlic, and sour cream make for a savory, delicious side dish or appetizer. The potatoes are sliced in half and filled with sour cream mashed potatoes, lightly sautéed seasoned crabmeat, and fresh chopped chives. Position the top rack in the top third of the oven and place a sheet of foil or a baking sheet on the bottom rack to catch any possible drips. Scrub the potatoes and remove any imperfections, eyes, and cuts. Pat the potatoes with paper towels to dry. Rub the potatoes all over with olive oil and then sprinkle with kosher salt. Prick the potatoes in several places with a fork and then place the potatoes on the top rack. Bake the potatoes for about 1 hour to 1 hour and 10 minutes, or until they are fork tender. Set the potatoes on a rack until they are cool enough to handle. Meanwhile, in a bowl, combine the crabmeat with the lemon juice, Old Bay Seasoning, and minced garlic. Toss gently. Melt the butter in a skillet over medium heat; add the crabmeat mixture and cook for about 3 to 4 minutes, stirring frequently. Slice the potatoes in half lengthwise. Scoop the flesh out into a mixing bowl, leaving about 1/8-inch in the shell. Add the chives and sour cream to the potatoes in the bowl and mash until smooth. Fold in the crabmeat mixture until well blended. Taste and add salt and pepper, as needed. Arrange the potato shells in a lightly oiled baking pan and fill them with the potato and crabmeat mixture. Sprinkle them with grated cheese and more chives. Place the potatoes under the broiler and cook until the cheese has browned, or about 3 to 5 minutes. Once finished, serve and enjoy! The recipe is versatile and can be adjusted with other ingredients to suit your taste. Add a few tablespoons of crumbled cooked bacon to add some smoky flavor to the potato filling. Or, for additional color, sprinkle the potatoes lightly with sweet paprika before you add the cheese. For cheese, choose a mild cheese that won't overwhelm the crab flavor. Mild cheddar cheese is a good choice, or top them with some shredded fontina or grated Parmesan cheese.